Schools in rural towns can offer a number of benefits to students, such as modest enrollment numbers and tight-knit, supportive communities. The Vernonia School District, a small district of around 600 students, has been creative in developing unique opportunities for students to learn, grow and succeed. Situated on the edge of the Oregon Coast Range and surrounded by trees, Vernonia is instituting a new approach to learning by creating a sustainability curriculum. The new learning model takes advantage of the community’s surroundings, the cutting edge design of the new K-12 school facilities and campus which opened in 2012, proximity to natural resources, logging heritage, local resources and partnerships to create a multitude of living laboratories and natural classrooms. Following the example of its community over the years, Vernonia Schools has made the most of its locality, history and resources. The new curriculum uses human relationships to the natural world as its foundation, and features three levels of forestry education by which students are taught plant identification, proper forest management techniques, trail building proficiency, and watershed enhancement procedures. In addition a logging skills team competes against other regional schools working closely with several local logging companies and governmental agencies. As part of the sustainability curriculum, the school oversees the management of the ‘Old Mill Marsh’ wetland area. This 8.2 acre wetland mitigation project was developed on city land in exchange for wetlands that were impacted through construction of the new school campus. Each year students remove invasive species, plant native plants and map and build trails. A greenhouse supported by a grant through the Bureau of Land Management (BLM) was constructed on campus and is shared with the local Upper Nehalem Watershed Council (UNWC), providing a space for students to raise native plants. 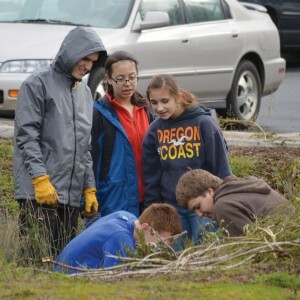 “The sustainability curriculum encourages all our teachers to find ways to include the natural world and our region’s surroundings into daily instruction,” says Vernonia School Board Chair Bill Langmaid. Each year all K-12 students participate in several ‘Sustainability Days’ when learning is focused on concepts that include the life cycle of native salmon populations, the impact of invasive species, and sustainable forestry practices. Students spend at least part of the day doing field work, including riparian restoration projects, tree planting, and wetlands maintenance. As part of the sustainability curriculum, Vernonia is developing a Career and Technical Education program. A new shop facility is being constructed in 2014 and the District has developed partnerships with several local entities including the UNWC, BLM, Oregon Department of Fish and Wildlife, the OSU Extension Service and Stub Stewart State Park. As part of an internship program, high school students worked on maintenance projects, utilizing Geographic Information System mapping techniques, trail building, using customer service skills and enhancing local watersheds and riparian zones. Students received valuable, real-life work experiences all while receiving a summer pay check. Vernonia’s small size is actually be a benefit when it comes to education. Katie Cook and her family moved to Vernonia a year ago. Her school age children had previously been enrolled in the Hillsboro and the Beaverton School Districts. Another attribute that makes an education at Vernonia Schools extremely unique is their robust Foreign Exchange Student program. In each of the last half-dozen years, approximately 20 students arrived at the end of each summer from all over the world to spend the school year in Vernonia. The students live with, and become part of, local families giving students, families and the entire community firsthand experiences with other cultures, lifestyles, languages and perspectives. Students from countries as diverse as Germany, Kenya, Romania, Taiwan, Italy, Kurdistan, and Norway spend the year in Vernonia becoming teammates, family members, and lifelong friends. Past students regularly return to visit their ‘American families’ and Vernonia students often go to visit their friends in faraway countries. The Foreign Exchange Student program gives Vernonia’s schools and the community a truly international feel. The Vernonia schools have also experienced success in other endeavors. The school band program earned a State Championship in 2011 and finished 3rd in 2012. Mentored by local volunteers, the robotics program has competed in Oregon FIRST Robotics programs for the last three years, and has seen great success for such a small and newly created program while competing against all sizes of schools from throughout the Pacific Northwest. In 2012 the Loggerbots finished third in the qualifying rounds and reached the semifinals in just their second year. Vernonia’s sports teams, the Loggers and Lady Loggers, compete in the state’s 2A division. Recent successes include four individual state champions in track and field in 2012, a fourth place finish at the state tournament in boys’ basketball in 2010, back-to-back league championships in girls’ basketball in 2013-14, three straight years of qualifying for the state tournament in volleyball in 2012-14 and a league championship in softball in 2014. For a small, rural school district, Vernonia is working hard to create unique and exciting learning experiences for its students, helping propel them to success in careers, university studies, and life.